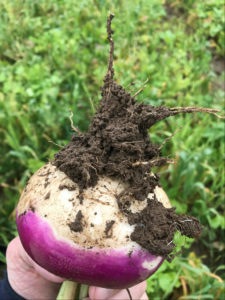 A Wisconsin farmer is improving soil health and fertility on cropland he farms across the state border near Waukon, Iowa. He added winter wheat to his rotation, followed by a diverse cover crop. Kramer’s daughter’s check on the wheat crop. Adam Kramer, who owns and operates Black Sand Granary in Prairie du Chien, said he hopes to break up pest cycles, improve soil health, and reduce input costs by adding a small grain to his corn-soybean rotation. In October 2017, Kramer planted about 110 pounds per acre of soft red winter wheat on 70 acres following soybean harvest. Soil tests he conducted in 2015 when he started farming the property indicated the farm was deficient in many categories, including a compaction layer at six inches. Because he applied fertilizer at higher rates to build soil fertility, Kramer used a growth regulator on the wheat to help reduce the potential for lodging due to higher nitrogen application rates. Other options for decreasing lodging include using varieties with stronger straw or shorter stems. Kramer also applied a fungicide to help protect against rusts and Fusarium head blight, also known as scab. 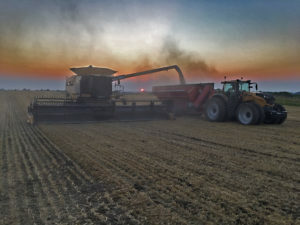 He harvested the wheat on July 23, 2018, with an average yield between 95-100 bu./ac. and an average weight of about 56 lbs./bu. Kramer sold a portion of the wheat to ADM in Boscobel, Wisconsin and kept some for cover crop seed. The biggest Iowa-based buyer of food-grade oats and other small grains in the area is Grain Millers in St. Ansgar. “There are people growing food-grade small grains in Allamakee County and throughout Iowa, but there are limited options for buyers,” said Rolling. Drone photo of the cover crop from August. She said, however, that small grains can impact net returns beyond market prices. “Studies have found that diversifying rotations can improve corn and soybean yields in the following years, which then improves the profitability of the entire rotation,” said Rolling. Allowing livestock to graze cover crops adds additional benefits. Although Kramer had good biomass, his farm is not currently set up for grazing. Early-seeded cover crops can produce substantial amounts of biomass which can provide good forage. Producers should be careful, though, when selecting mixes to plant species with balanced nutrients and graze them at appropriate heights. It is also important to know herbicide restrictions from previous crops. 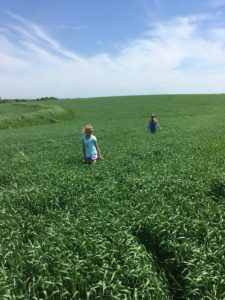 “If you plan to graze cover crops in the fall, treat it like a prescribed grazing system and keep the animals out of the field in wet conditions and remove them when there are still several inches of aboveground biomass remaining,” said Rolling. 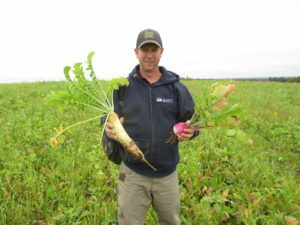 Now is the time to start planning for next fall’s cover crop. There may be financial assistance available for conservation crop rotations and cover crops through your local NRCS/SWCD office. The next signup deadline for the Environmental Quality Incentives Program (EQIP) is March 15, 2019. 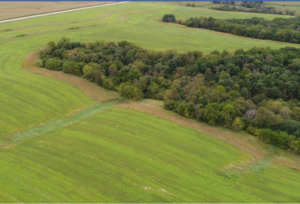 Producers in Allamakee and Clayton Counties can apply for EQIP funds through a Regional Conservation Partnership Program (RCPP) project by adding a small grain to a rotation and following it with a diverse cover crop. 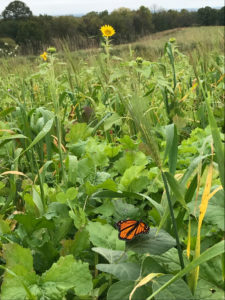 If you plan to plant cover crops following small grains or on silage ground, try planting a diverse mix to take advantage of the longer growing season. Your local NRCS/SWCD staff are available to help you determine what mix would meet your goals.